Our 'venue hire only', self catering wedding option, is not available on Saturdays. This option is primarily designed as a 'holding the date' facility. It allows you to decide your exact requirements, or upgrade to one of the wedding packages, later. 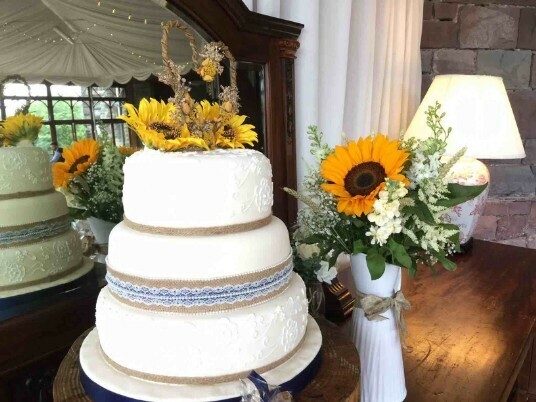 If you prefer to organise everything yourself, and provide your own wine and food, your own welcome drinks, and want a blank slate to fully plan your own wedding, you would stay on this self-catering wedding package. You would then select wedding meals, buffets and drinks etc from our Regular Tariff page, based on your exact numbers and requirements, with no conditions attached for minimum guest numbers etc. You may choose what you require from us, or select services from our approved list of independent local suppliers (allowing you to negotiate the best deal). To ensure the correct standards of catering are met, you must choose professional caterers / suppliers that we have on our approved list, or that we are prepared to add to our approved list. See more on self-catering terms here. 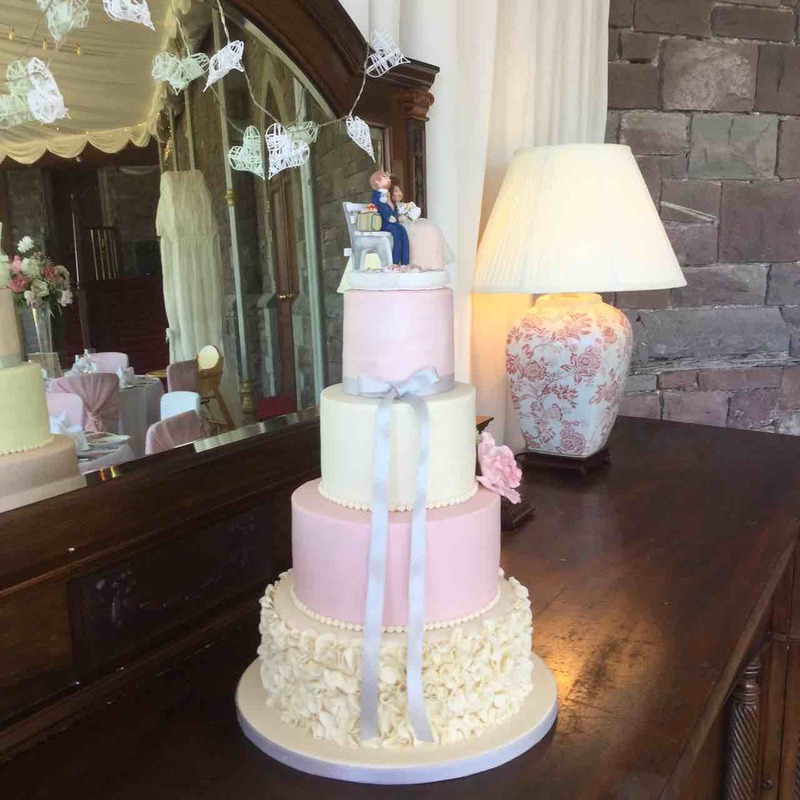 In practice, most couples will switch to one of our discounted wedding packages as they are very good value. Our packages offer huge discounts on venue hire (or no venue hire at all), so work out more cost effective for you. 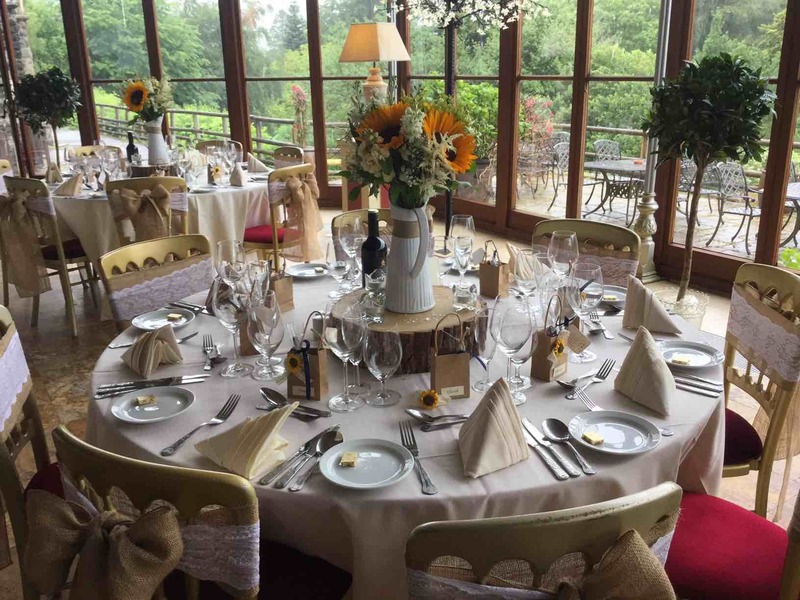 While our wedding packages offer great value for money, if you are undecided on your 'minimum number of guests', hiring the venue on this flexible self-catering arrangement is a good starting point - as you can upgrade later. (3) to our 'Members Wedding Package'. However you cannot switch to our Last Minute Wedding Package. To upgrade, you invite a set minimum number of guests to your wedding breakfast and encourage a set number to stay overnight, as per the Wedding Package selected. 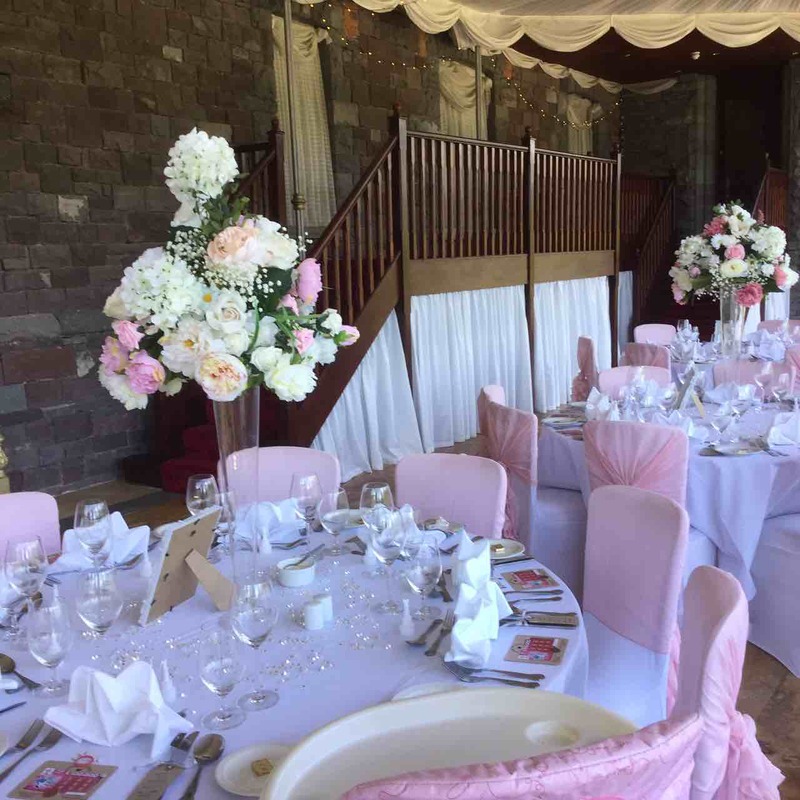 If you are in any doubt about being able to reach the minimum numbers required on our discounted wedding packages, you can book this self catering wedding first, to secure the date and venue. Then at your leisure, phone around your guests, send out your RSVPs, and decide whether you would prefer to be on a discounted wedding package or on a more flexible arrangement. 6. You can choose one of our Drinks packages. See our Regular Tariff page for all the options you can select individually (or buy in from our approved external suppliers). 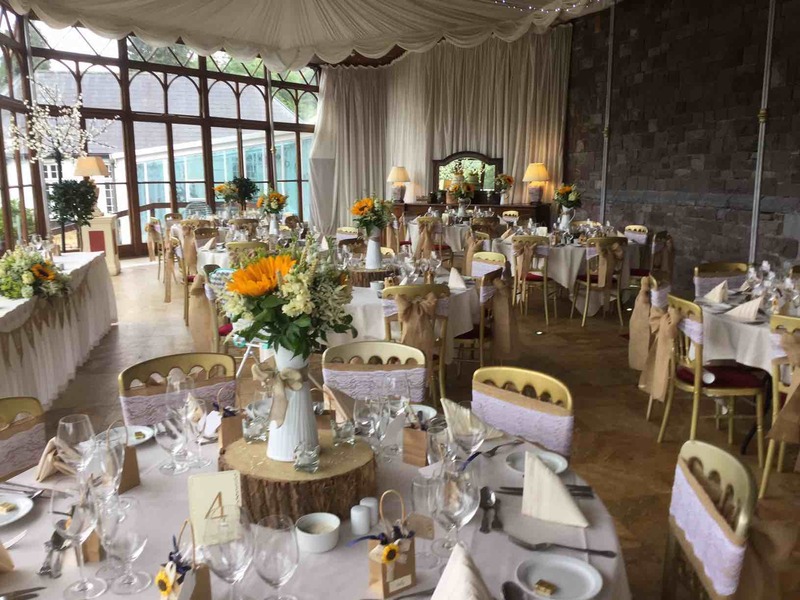 The idea of our self-catering weddings is that you hire the space, and organise everything yourself, using approved suppliers, as an alternative to the castle doing everything for you. We can of course do everything for you, at £45/ guest for the 2 course wedding breakfast, or £52/ head for a three course wedding breakfast. We include full waitress service, our wedding planning service, assistance with table layout, menu selection, menu planning, seating/ table plans etc. See either our regular tariff or the wedding packages. *As we will have other guests staying, on a B&B basis (unless your guests fill all our rooms!) we cannot offer all-day exclusive use of the gardens, courtyard and bar. However, for your wedding photographs, we can arrange for sole use of the relevant outside areas at set times. This we arrange in advance, in conjunction with your wedding photographer and to fit in with your own wedding ceremony timings. 1. You can invite as many or as few guests as you wish; the cost for the venue is the same. The limit for numbers in the Conservatory however is 130 seated. 2. You can organise your own caterers or choose our catering service. When choosing external caterers you and they must comply with all necessary legal requirements concerning the service of food. 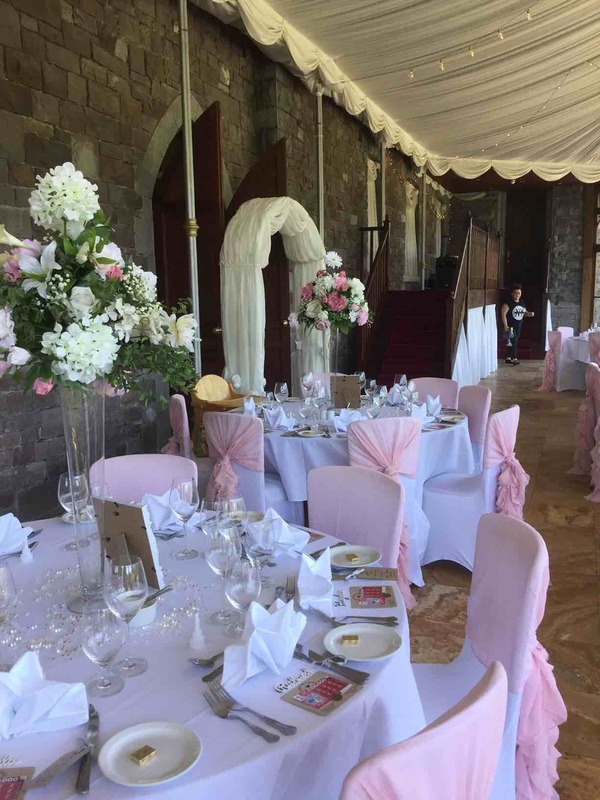 This means you will need to hire in professional caterers certified ideally at Food Hygiene level 5 or 4, who are approved by the Castle, who carry their own insurance and who meet all necessary Health and Safety requirements. 3. You can self-cater for bottled wine and toasting champagne at the wedding breakfast, and welcome drinks, only - i.e. the wine and champagne that you provide as part of the wedding banquet. Or select one of our drinks packages. You cannot however self-cater for bar drinks which guests buy at their own private expense; these must be served by and from the castle bar. Our drinks licence requires us to be aware of who we are serving, whether they should be served or have had 'enough', and to ensure no under-age drinking. For this reason individual bar drinks may only be served by the castle's staff from the castle bar. 4. No requirement for guests to stay overnight - but accommodation is available on an excellent two night discounted deal if you wish to have guests stay and book direct with us. 5. Free Upgrade to any of our current Wedding Packages, subject to availability, excluding the Last Minute Wedding Package. 7. Self-catering may be suitable for larger weddings if you find you can cater for many more guests at a lower cost per head, or for example, if you opt for a buffet only wedding. 8. Total flexibility to choose from our approved Wedding Suppliers and develop your dream wedding entirely as you wish. Flexibility to select from our regular wedding tariff or to upgrade to one of our wedding packages, at a later date. You will be planning your own wedding, entirely on your own, without the help of a Wedding Planner (our Wedding Planning Service is included only on our Wedding Packages). This means you will need to study everything on our website to teach yourself everything you need to know. Start with our general wedding planner guide and read this very thoroughly. Also study our pages on planning your own wedding at the castle, on the understanding that you are arranging everything yourself; on this venue hire only arrangement, we just hire you the space. The purpose of a self-catering wedding is to save you money over hotel rates on drinks and catering. 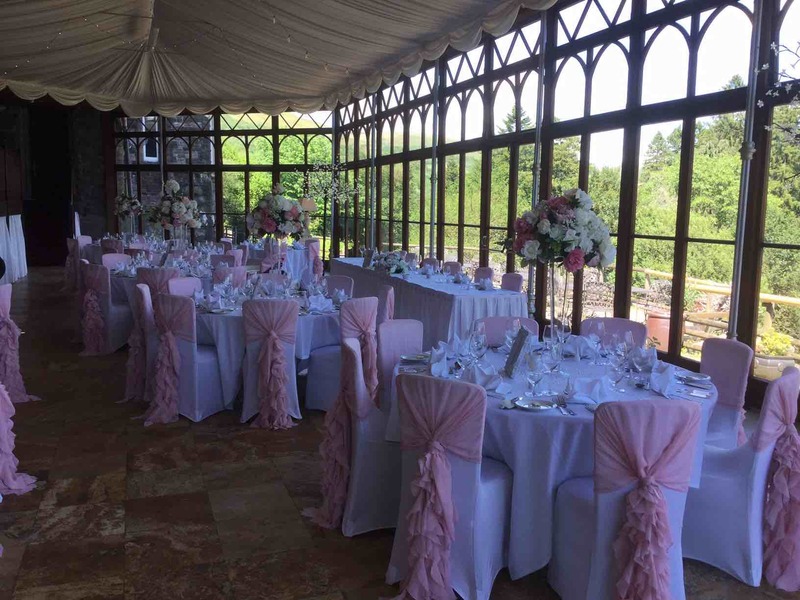 However you will find that our wedding packages offer greater savings. It may take you a while for you to work out which package is the best option for you - this depends on your guest numbers. 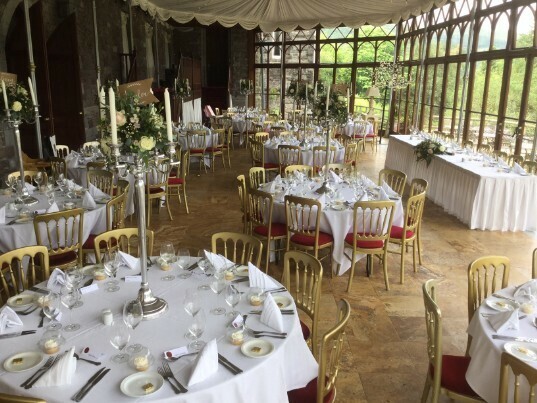 Our hire-venue-only self-catering package enables you to secure the venue and date, and decide later which route, self-catering, pick and mix from our regular tariff, or a wedding package, offers you best value. The higher your guest numbers, and the less you offer your guests, the greater the likelihood you will save on the self-catering option. For a normal sized wedding of 50 - 120 or so guests, with a full wedding brekfast, you will save money on a wedding package. We allow you to upgrade at any time, but you should do so at least 6 months before your wedding date, to ensure sufficient B&B availability. 3. PICK AND CHOOSE from Castle Services? 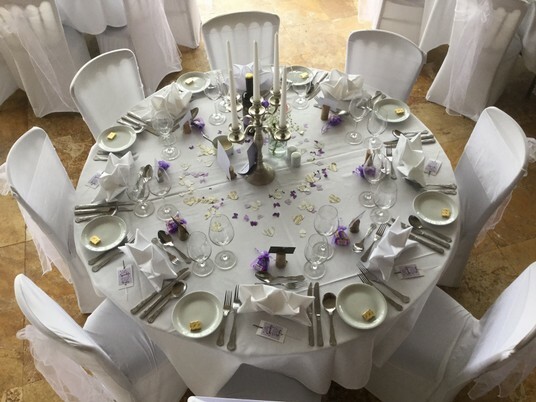 We have a Bespoke Wedding Tariff where you can 'opt in' to any additional services we provide - such as welcome drinks only, canapes only, or the drinks package (scroll to bottom of link) only, or evening entertainment, or evening buffet only, etc. The Function Room can be hired additionally if required. Normally we will have other B&B guests staying and will serve them evening meals in the function room and bar. 4. The main Bar is for the Public and our B&B Guests. The 'hire the venue' option does not include the exclusive use of the main hotel's Patti Bar. While your guests may pop into the hotel bar to buy drinks, as any member of the public can, your guests will need to make way for other guests. This means your wedding guests must return to the function rooms you have hired, rather than dominate the bar area to the detriment of our other guests' quiet enjoyment of the bar area. Guests are also able to stay the night before the wedding (For a Friday wedding, this would be the Thursday night) at half the regular midweek rate, on our two night discounted B&B deal. 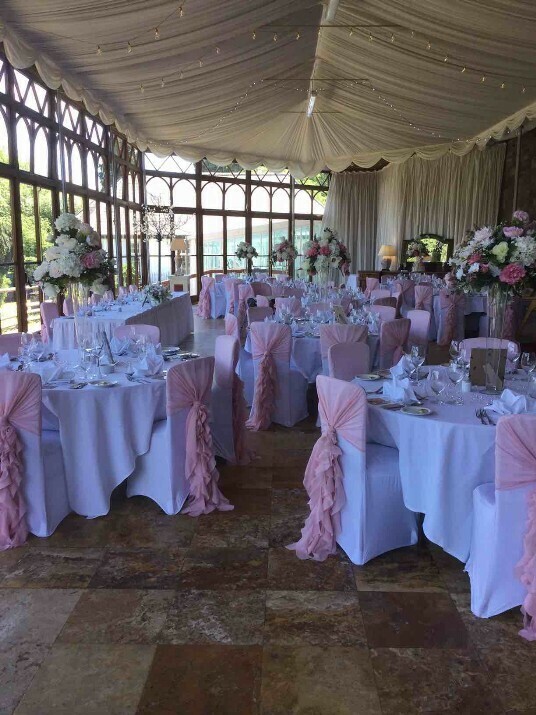 Now let's say you invite 50 guests for the 2 course wedding breakfast at, £45/ head, add in welcome drinks at £5/head, and you have £50 / head for your day wedding guests. 50 guests @ £50 each = £2,500. So total cost under this flexible package including the rooms you are hiring would come to £5,100. Next: See savings available under the Special Wedding Package. -Weekend: Special Wedding Package on a SaturdayWeekend: Special Wedding Package on a FridayWeekday: Midweek Wedding Package, Sunday-ThursdayLast Minute Wedding Package, on a SaturdayLast Minute Wedding Package, on a FridayMembers Wedding PackageCeremony OnlySelf-Catering WeddingDon't know yet! 1. The Conservatory serving and preparation facility is only suitable for your external catering company to prepare and serve food that has been cooked off-site. It has Bain Marie dishes that will keep food warm for serving, fridges, Jack Stands and serving facilities - but does not have ovens for re-heating food. 2. Any food you supply must be prepared off site by professional caterers approved by the castle and the food must be served on site by your caterers and their own waitressing staff. 3. The catering company must be approved by the Castle and carry appropriate insurance. 4. The approved caterers must ensure professional standards are met and to ensure full compliance with Health & Safety laws regarding the serving of food on our premises. They should also be graded Food Hygiene level 4 or 5. 5. There is no cooking allowed on the premises. Outside caterers cook outside, bring the food in, prepare it for serving using their own equipment, and physically serve your guests, using their own plates and cutlery and their own staff or staff provided by you. 6. Should you wish to hire our plates and cutlery, there is a charge for this, and should we need us to wash and clean any items hired, there is a further charge for pot-washing staff. 7. If you wish us to serve food, there is a charge for waitress cover.